In 1843, fourteen-year-old Hanson Gregory left his family home in Rockport, Maine, and set sail as a cabin boy on the schooner Achorn, looking for high-stakes adventure on the high seas. Little did he know that a boatload of hungry sailors, coupled with his knack for creative problem-solving, would yield one of the world’s most prized and beloved pastries. Lively and inventive cut-paper illustrations add a taste of whimsy to this sweet, fact-filled story that includes an extensive bibliography, author's note, and timeline. Pat Miller is Contributing Editor for "LibrarySparks" magazine, and has written 20 professional books and 200 articles for school librarians. Her first published book Substitute Groundhog was names a Junior Library Guild Selection. She is a former school librarian, married to a former school principal. They have three grown children who read to their toddlers, and an illiterate Jack Russell terrier. Visit her at www.patmillerbooks.com/. Vincent X. Kirsch is the author and illustrator who has worked with publishers such has Farrar, Straus, & Giroux, and Bloomsbury USA, where artwork for his first book Natalie and Naughtily was accepted into the 2008 Original Art Show at the Society of Illustrators in New York. He now lives in Los Angeles, California. Noah Webster and His Words is his first book with Houghton Mifflin. Visit his website at vincentxkirsch.com. "A lively offering for reading and sharing that will encourage the youngest of researchers to wonder and learn about other everyday items in their world." 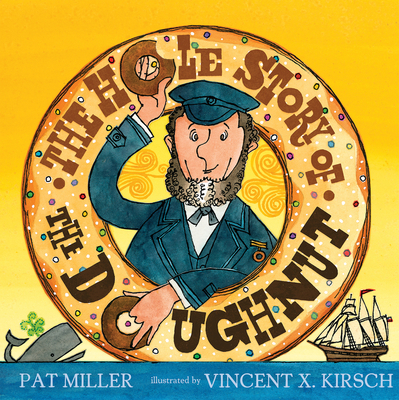 "Playful cartoons and dramatic narration tell the true tale of a New England mariner turned doughnut inventor... Mimicking Gregory’s ring-cutting innovation, the book’s memorable design takes large circular cuts out of Kirsch’s vibrant watercolors, transplanting the circles to the facing pages while leaving behind an empty frame for Miller’s (Substitute Groundhog) text."